Chimpanzees are the forgotten link in America’s manned space programme—with the first, simian-piloted US space capsule to orbit the earth splashing down off Bermuda more than 50 years ago. When the space programme was in its infancy in the early 1960s, the US National Aeronautics & Space Administration used chimps to test how space flight would affect the human body. Before astronaut Alan Shepard Jr. made his famed first American suborbital space flight in 1961, a chimpanzee named Ham completed a successful suborbital flight in a Mercury capsule. And in a dress rehearsal for John Glenn’s historic 1962 orbital flight, chimpanzee Enos blasted into space in Florida on board a NASA Mercury Atlas 5 on November 29, 1961. The young chimpanzee completed his first orbit in one hour and 28.5 minutes. Enos was originally scheduled to complete three orbits but was brought back after the second orbit because the spacecraft was not maintaining proper attitude. According to observers, Enos jumped for joy aboard the recovery ship USS Stormes—which retrieved his capsule off Bermuda—and ran around the deck enthusiastically shaking the hands of his rescuers. Aboard the Stormes, he ate two oranges and two apples—his first fresh food since he had gone on a low-residue pellet diet. The destroyer dropped Enos at the Kindley US Air Force Base hospital in Bermuda. The chimp was walked in the hospital’s corridors and appeared to be in good shape. His body temperature was 97.6 degrees; his respiratory rate was 16; and his pulse was 100. Apparently reentry, reaching a peak of 7.8 g, had not hurt him. His quiet composure at his Bermuda “press conference” surprised the correspondents. 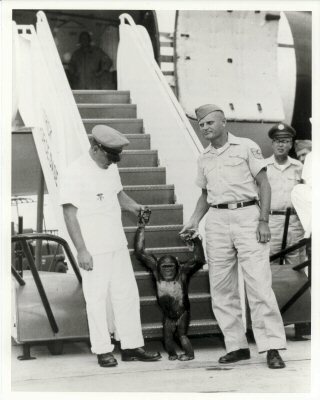 On December 1, 1961, Enos left Bermuda for Cape Canaveral in Florida for another round of physicals [pictured at top]. A week later he departed for his home station at Holloman Air Force Base in New Mexico for well-deserved retirement. Enos’s was the second and last chimp mission into space—the flights having proved humans could withstand the rigorous conditions of blast off, weightlessness and re-entry. On November 4, 1962, Enos died of dysentery caused by shigellosis, which was resistant to antibiotics of the time. The chimpanzee had been under constant observation for two months before his death. Pathologists reported that they found no symptom that could be attributed or related to his space flight a year before. Dr. Marvin Grunzke, a US Air Force major and aeromedical specialist, was a key trainer in NASA’s “animals in space” programme. In the interview below he talks about the 50-year anniversaries of the two astrochimp space flights.